Bolivia's president has given more than 30,000 square km (18,600 sq miles) of land to indigenous peasant communities under a programme of agrarian reform. 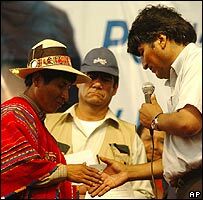 Evo Morales launched the programme after landowners walked out of talks with the government, warning they would take action to defend their estates. Thousands of peasants gathered in the centre of Santa Cruz to see Mr Morales launch his agrarian revolution. They cheered and waved rainbow flags symbolising indigenous resistance. The venue for the ceremony was carefully chosen: Santa Cruz is the home base of Bolivia's main landowners' federation, which is deeply opposed to the land reform. When its leaders walked out of talks with the government, they warned that their members would form self-defence groups to protect their estates. But President Morales is clearly in no mood for compromise. Bolivia's big landowners, he said, had to accept that the lands their ancestors stole during the Spanish conquest five centuries ago would now be returned to their original owners. The land handed out on Saturday was already owned by the state. But Evo Morales has said his government will also seize private holdings that are judged not to be in productive use to meet his target of redistributing around a fifth of Bolivia's total land area over the next five years. A new world axis of power?